It was a pretty low key day in the food department for me! After getting home so late last night, I didn’t really want to think about meals today, but I made do pretty well. I decided against a workout because of my lack of sleep! For breakfast, I was craving a smoothie. I added mango chunks today, which I loved! 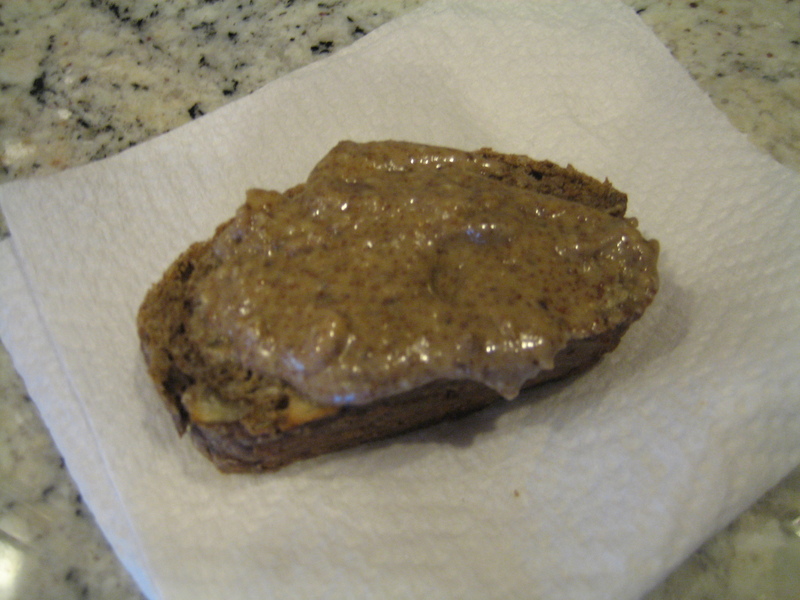 I also munched on a piece of Banana Hemp Manna Bread with almond butter. I love that bread! 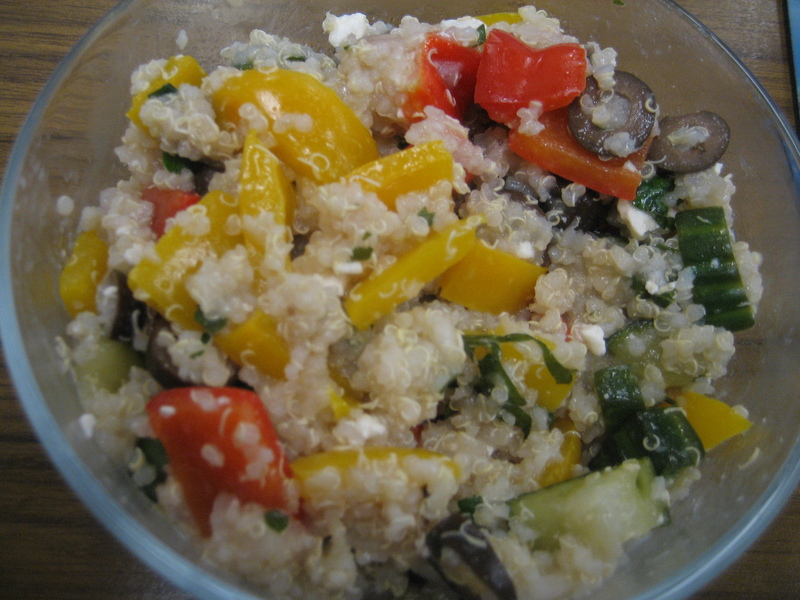 Lunch was leftover Mediterranean Quinoa Salad from yesterday eaten at my desk. 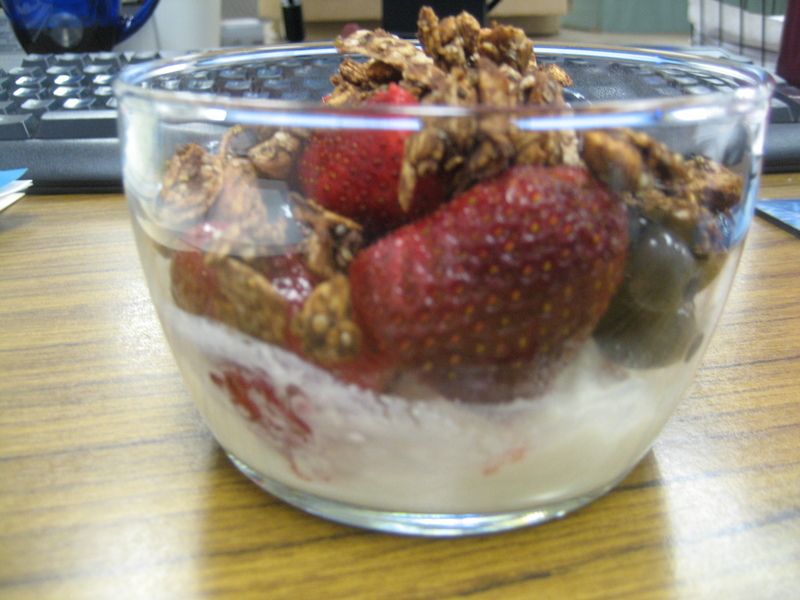 And, a yogurt parfait with cottage cheese instead of yogurt! A few weeks ago, Daisy Cottage Cheese sent me some of their 2% Low Fat Cottage Cheese to sample. This is the first time I am digging into it! I was out of yogurt, since we didn’t get to the grocery store yesterday, so I figured it was the perfect time to try it out. 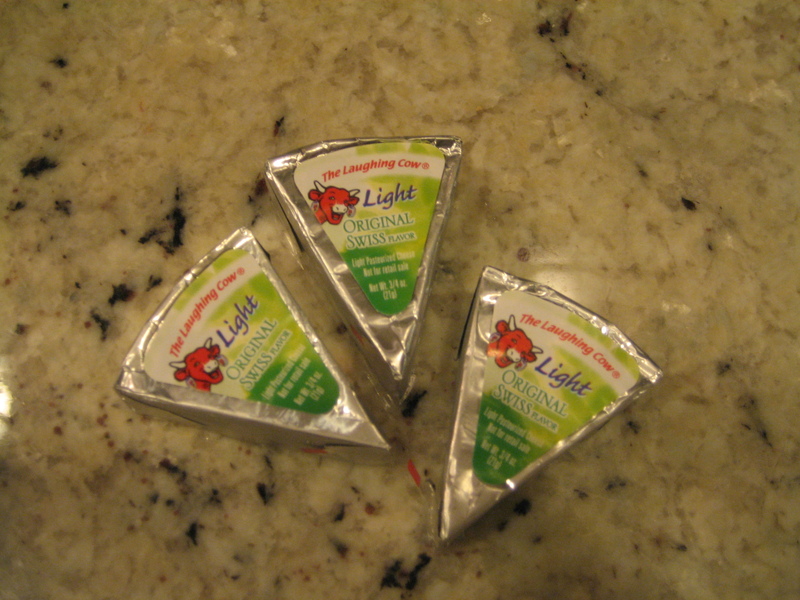 I have not had a lot of cottage cheeses, but overall I liked what I tried from Daisy! It was thick and creamy, unlike others that I have had. 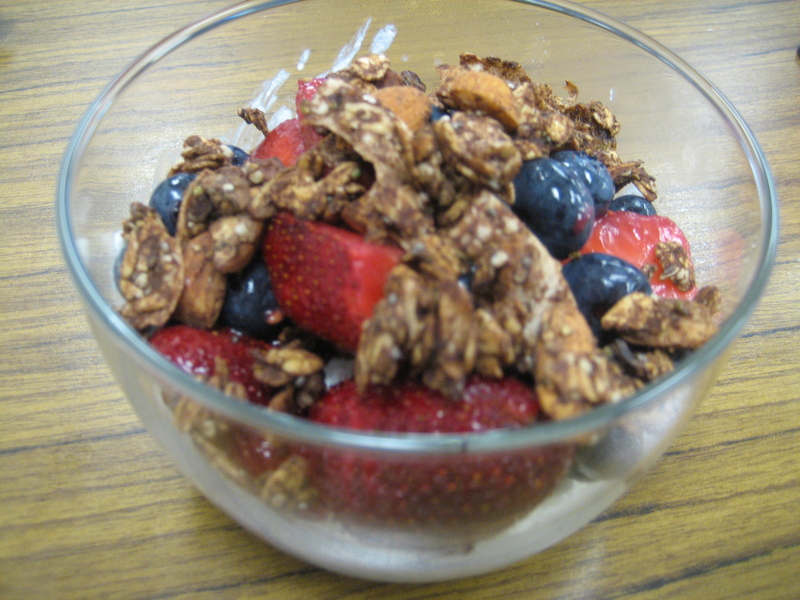 I topped my serving of cottage cheese with berries and my homemade Chocolate Coconut Banana Granola. 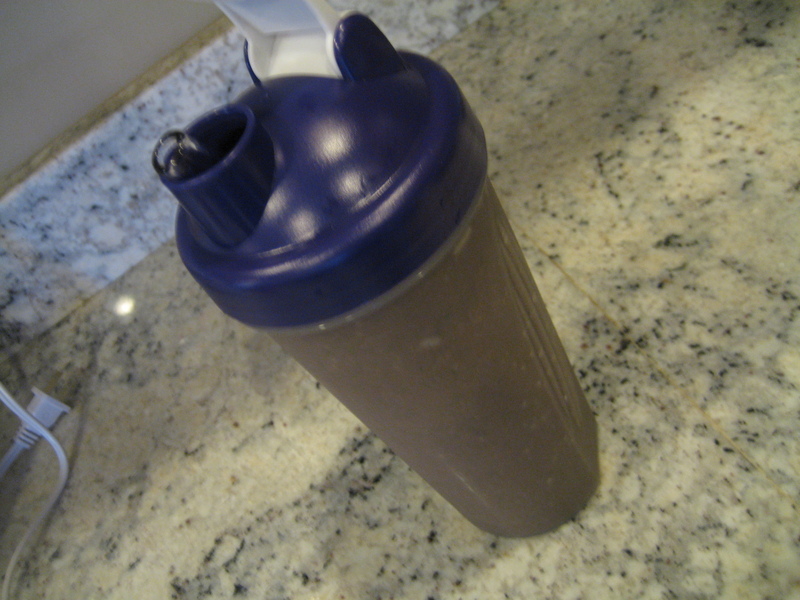 One serving is 1/2 cup and contains 90 calories, 2.5 grams of fat and 14 grams of protein! Pretty good. I plan to try out my samples a few different ways, so stay tuned! For dinner, I wanted something easy again, but felt like comfort food. 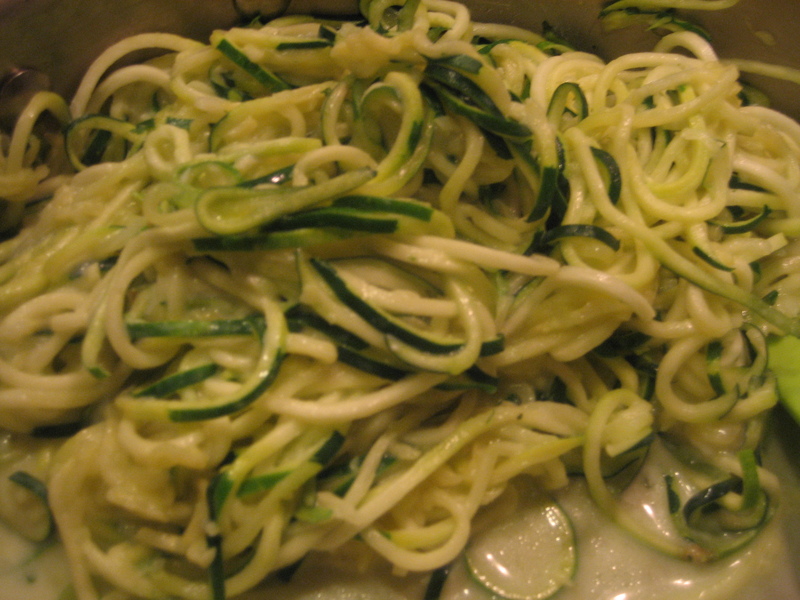 I decided on Zucchini ‘Pasta’! 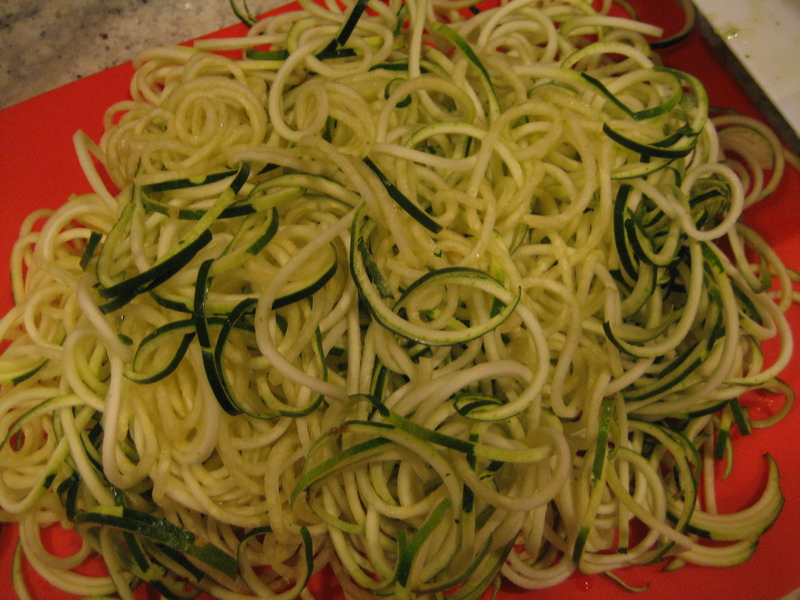 I broke out my spiralizer, and sliced up 4 zucchini’s. Then, I threw all of the ‘spaghetti’ in a saute pan over medium heat (already heated with a little olive oil). Once heated threw, I added 3 laughing cow wedges to the pot and covered it for about 3-5 minutes until the cheese gets soft and melty. Mix it all up! The cheese almost makes it like a light Alfredo sauce. 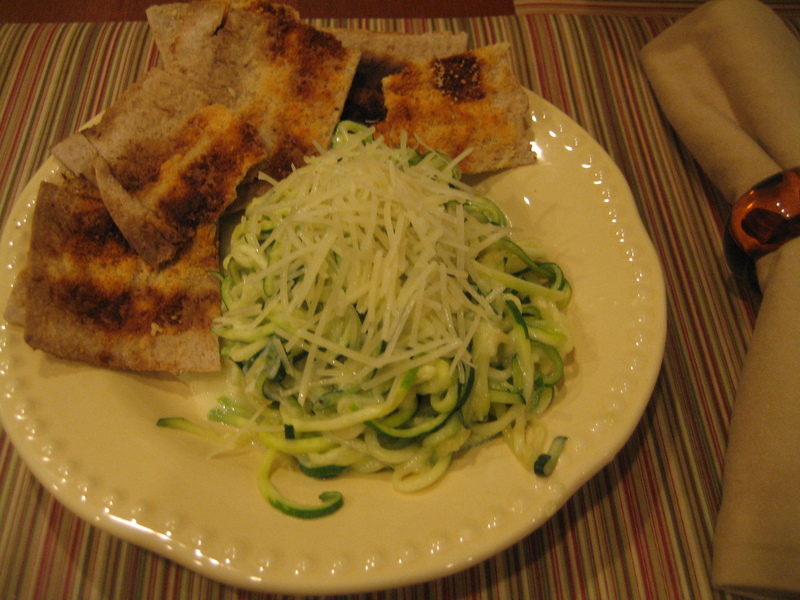 Along with the zucchini ‘pasta’, I made some homemade pita chips. 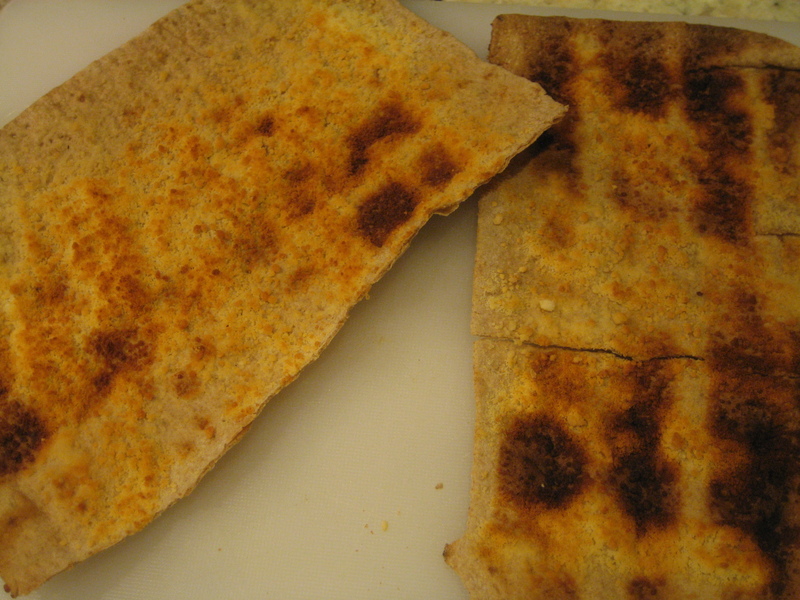 I took a whole wheat lavash roll-up from Whole Foods and spread it with a thin smear of butter, sprinkled with parmesan cheese and toasted in the toaster oven for one cycle. Once toasted, I cut them up into squares. They came out crispy and delicious! Perfect with our ‘pasta’. 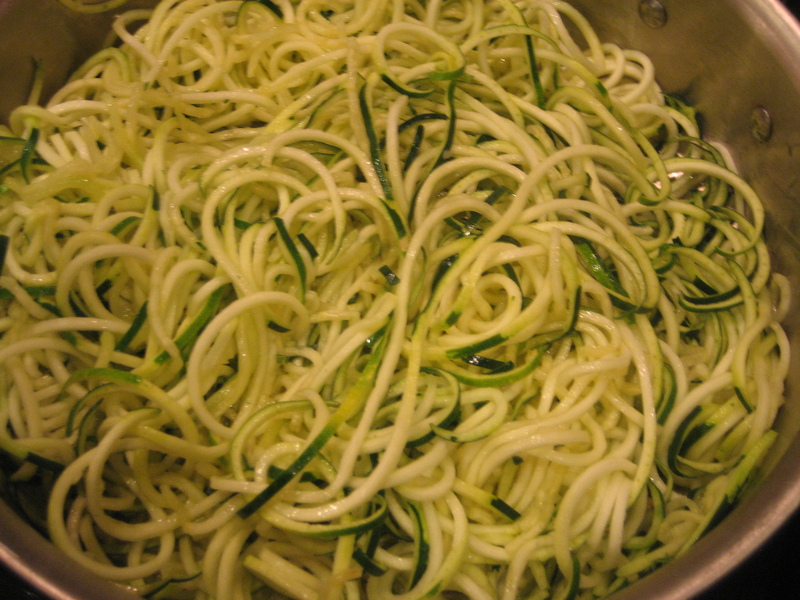 Another super easy and quick meal, if you have a spiralizer. If not, you could throw the zucchini into the grater of a food processor, or chop by hand (but that would obviously take longer). These chips would work perfectly with lots of meals, and dipped in hummus! Yum that quinoa salad does look delishhh the next day- I love when foods keep well and even more when they are better the next day! 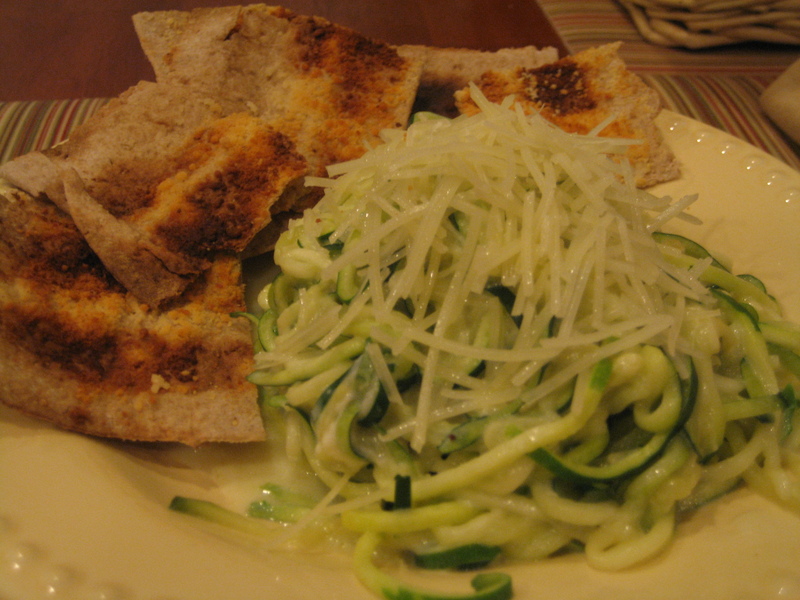 The zucchini pasta and chips look awesome! I’ve never wanted a sprializer before but maybe now I do! I’ve been looking at spiralizers and trying to decide between a few out there. What kind do you have? Are you happy with it? The two I keep seeing are the Spirooli and the Saladacco. Let me know what you think. I have only used it 3 or 4 times because I haven’t had it for very long, but I have been happy with it each time. It has 3 different blades for different sized spirals which I like as well. I have never seen the Spirooli, but I do know that a lot of people in the blog world like the Saladacco. 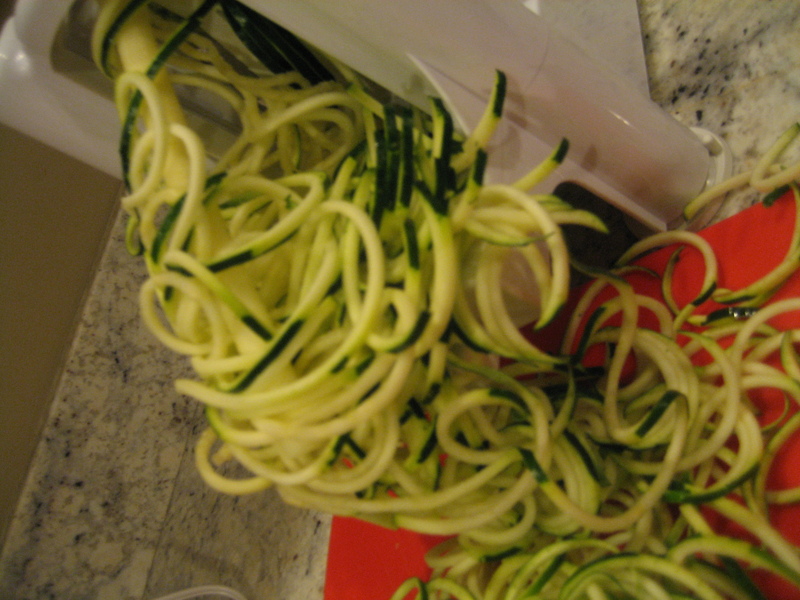 The reason I did not get that one is because it gets ‘spiraled’ into a cup in the spiralizer, so you have to keep emptying if you make a lot.